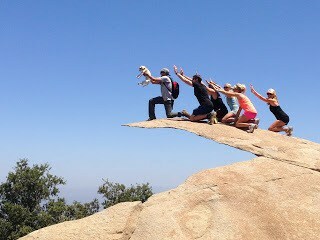 Potato Chip Rock is located at the peak of Mount Woodson in Poway, California. Recently, the hike has become popular due hikers posting creative images on Facebook and Instagram. 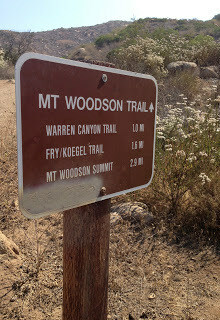 The hike is approximately 8 miles roundtrip, and during the summer months, it is recommended to start early in the morning due to Poway’s hot desert climate. 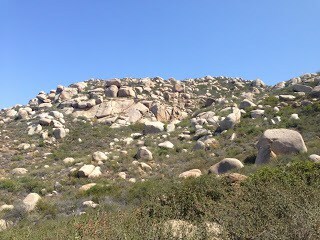 The first half of the trail is pretty much an uphill climb, where you’ll find the Potato Chip Rock at the very top. Don’t be surprised if you find a line of people waiting to take their picture on this popular rock! Then, you’ll descend the same trail on your way down. Obviously, you’ll find that going down is a lot faster than going up the trail. Once you get to the top of the mountain, Potato Chip Rock offers an unforgettable background to take pictures. It looks like you’re on the ledge of a cliff (which you basically are). The views and scenery from the top of the mountain are epic! Definitely bring your camera. Also, the uphill climb is challenging for even experienced hikers, so bring plenty of water. Fall/Winter/Spring during cool days. Try and avoid the summer months as it can reach over 100+ degrees Fahrenheit during peak hours. 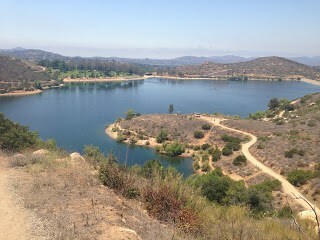 Due to Poway’s warm climate, it is recommended to start the hike early in the morning. Allow for 3-4 hours to complete. 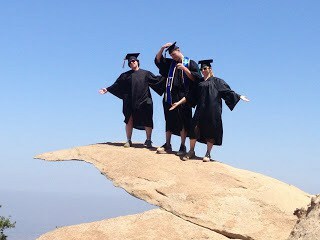 Since the Potato Chip rock is a popular photo location, going early will help avoid the crowds at the summit. Yes, on leashes. 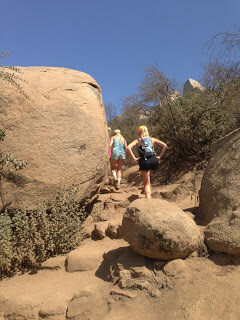 It is highly recommended to bring water and dog treats, as the hike to the top is grueling on dogs. It also helps to walk in front of a large group as the trail is very dusty and can affect the dog’s vision. 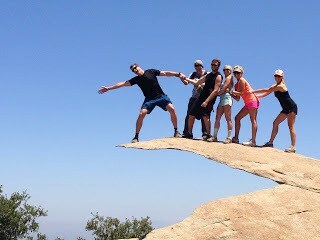 Have you tried the Potato Chip Rock Hike Trail? Share your experience with a comment below! Planning to try this hike after the summer. Who's in for the 5th of July, 2015? Can you camp over there? Let’s hope it continues to rock and not chip! Is it open every day? Did a 5k the day before. We went up the paved side which is very steep but with short breaks we made it. 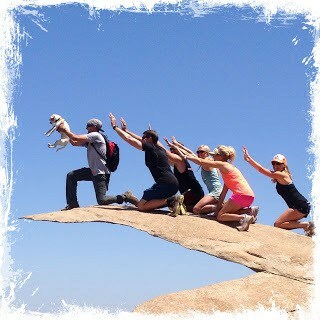 Loves the hike up and had fun taking pictures on Potato Chip Rock.